Wn Trou08 Criqueboeuf plage, StP Gruppe Trouville, K.V.A.'G'. Criqueboeuf plage is a small promontory to the east of Villerville and can be accessed from along the beach from Villerville or parking in Criqueboeuf and walking down to the beach. 1 x Vf Skoda bunker (SK Pak). 1 x Schnabelstand, (Vf observation). 1 x Ringstand 5cm KwK. 1 x 4.7 Pak K.36(t). 1 x 5cm KwK L/60 Pak gun. 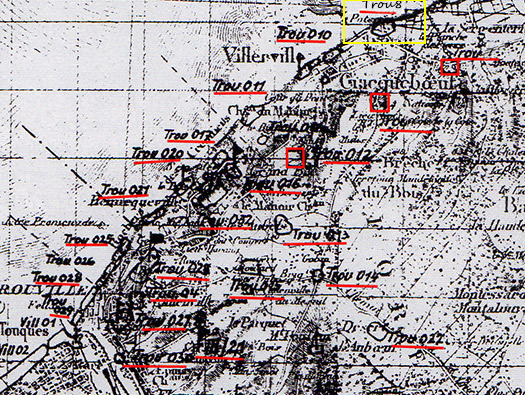 Plan of most of StP Gruppe Trouville, K.V.A.'G'. The walk from Villerville with debris all over the beach. A lovely old side valve engine. 141c bunker on the left and the protective wall on the right. Some may have a Tobruk actually fitted into the wall to protect the rear door. 141c a closer look at that wall. 141c entrance with its close combat window and the niche on the right may have held a speaking tube? 19P8 steel door with a small glass window and a rubber gas seal. 141c crew room. The uprights have hooks on to hold bed bunks. There would be steel strips bolted to the wall with corresponding hooks. How the bunk beds looked. 141c the bolts in the wall to hold the steel uprights. The 141c close combat window. 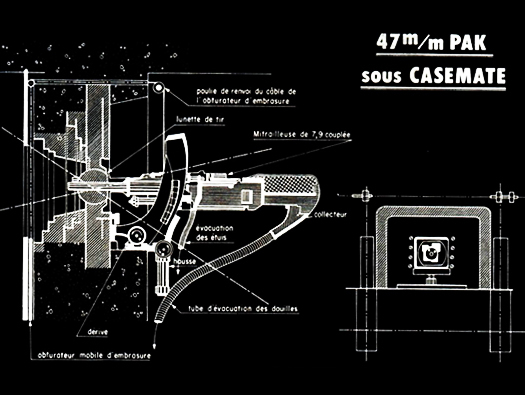 Frame of the gas pressure pump to overpressure the air inside the bunker to stop gas entering the bunker. The pump would be hand driven. Behind the 19P8 door is the escape hatch. 141c showing the steps down into the bunker. Escape with its steel steps broken away from a bunker. The different ways of making the escapes. Ringstand for a 5cm KwK. 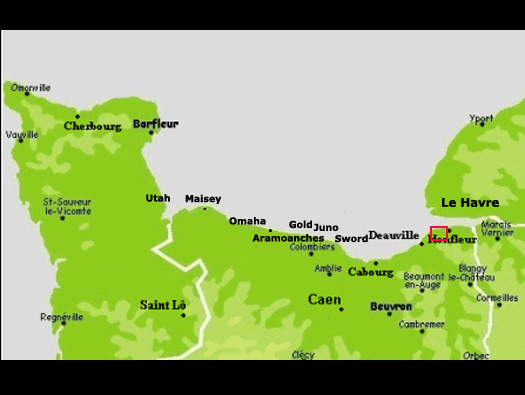 How it may have looked. Ringstand for a 5cm KwK and a Vf66 bunker. Ammunition niches all the way around. It may have looked very much like this one at Trou04. Vf66 possibly the ammunition room. Vf66 crew room with the escape hatch in the rear wall. Schnabelstand, (Vf observation) and SK Pak..
Schnabelstand, (Vf observation). Note the camouflage effect above the main structure. Vf Skoda bunker (SK Pak). Schnabelstand, (Vf observation) with the tide coming in. Close up of the camouflaged concrete. Vf Skoda bunker (SK Pak). The embrasure with the spent ammunition vat in front to catch the shells from the 4.8cm cannon. 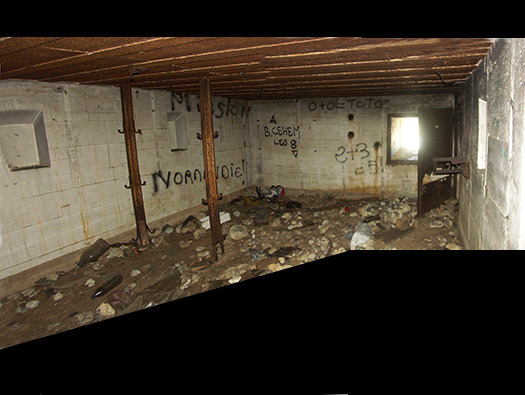 An original picture of the bunker and I have outlined the camouflage effects painted on it. Vf Skoda bunker (SK Pak) rear entrance. Vf Skoda bunker (SK Pak) showing the chicane entrance. Vf Skoda bunker (SK Pak). The main door either its all been removed or it was never fitted?? 4.7cm Skoda Pak. It was designed to fit inside a bunker and a special steel embrasure set into the concrete of the bunker. The special steel embrasure set into the concrete of the bunker. .
Vf Skoda bunker (SK Pak). The observation slit where the gun commander would shout fire orders to the gunners. Gun commander viewing through the slit.